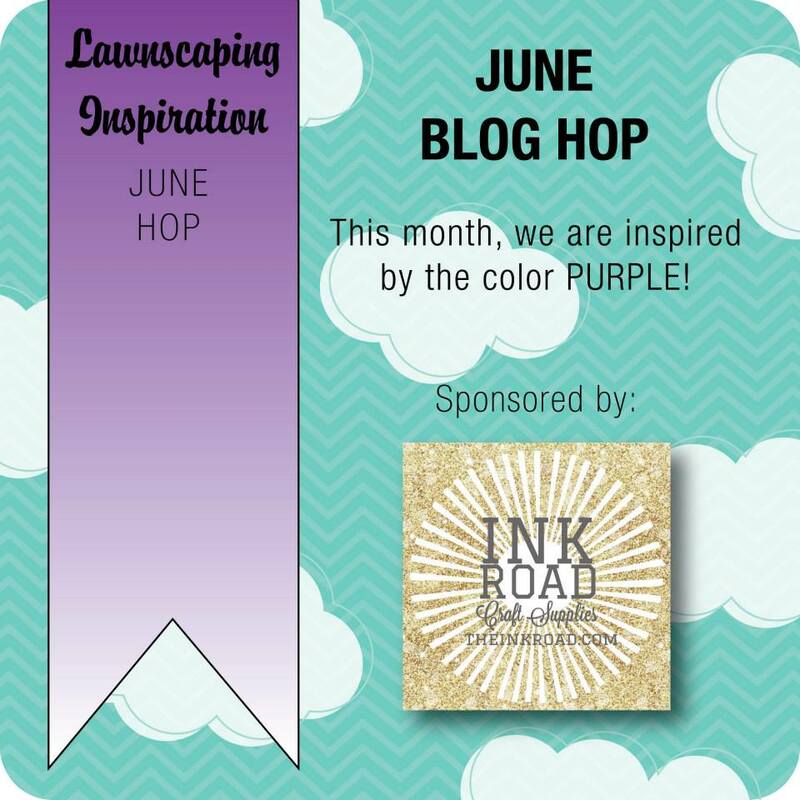 It’s time for the Lawnscaping Challenge Facebook Inspiration Team’s (FIT) Monthly Blog Hop! We normally have the FIT hop on the fourth Friday of the month, but there’s a special event happening on the blog next week, so our June hop is a week early! You’ve probably arrived from Yukari’s blog, but in case you’re starting here, you’ll find the full hop list at the bottom of my post! PURPLE is our inspiration color for this month’s hop, and while it’s one of my favorite colors, I sometimes have a hard time creating with it! I made a card with the walrus in Lawn Fawn’s “Critters in the Arctic” stamp set . The fan is from the “Best Pun Ever” stamp set. I stamped another set of fan blades on vellum and punched a hole in the center of the vellum and the center of the white fan blades. Then I attached a brad to the center, but didn’t press it down all the way so the vellum blades can spin. The “cool” background is made with the same technique (and stencil) that I used on this card. Before you continue the hop at Lenny’s blog, be sure to leave a comment for me so you can have a better chance of being the lucky winner of a gift certificate to The Ink Road! 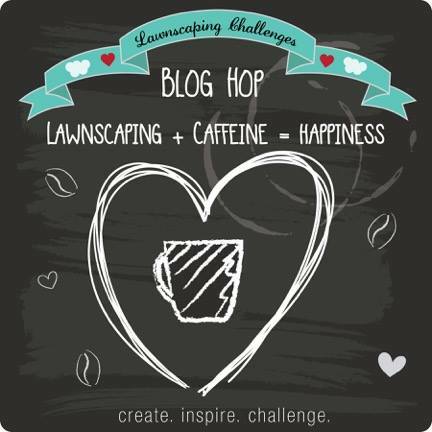 The Lawnscaping blog will be hosting a Lawn Fawn & coffee-themed blog hop next week, so make sure you stop by the Lawnscaping blog to get in on all fun and inspiration! Oh how cute! love the background and cute little seal. Love it…such a fun card! Love the look of the off set dots! Love the adorable image and purple is one of my favorite colors. The background is very cool. What an adorable card! Great job with the purples! Yes, my card and post are both all ready for the Coffee Blog Hop… can’t wait to see everyone’s work! How creative is this??? I love it all – the spinning fan blades, the gigantic snowball-like background, his sunglasses – yup, he’s ultra cool and so is your card!!!! love the extra fan blades and the seal! Very cute card and he DOES look cool! I absolutely love your card!! Super fun and cute! And it’s so funny how we both reached for the same set! Bwahaha he! This cracks me up! Such a cute card. Love that fan & walrus. Love this fun card! The seal is definitely too cool! Very fun card, I love the walrus. Love that shifted stencil and the sweet fan/walrus! Great card! Super cute!! I love purple and the fan and sunglasses are great focal points. Cute! I love the purples. Thanks for sharing. Woah! I’m totally seeing in 3D right now! Your card is so much fun! I love how you created this look!! Really like the background. Love those two colors together. 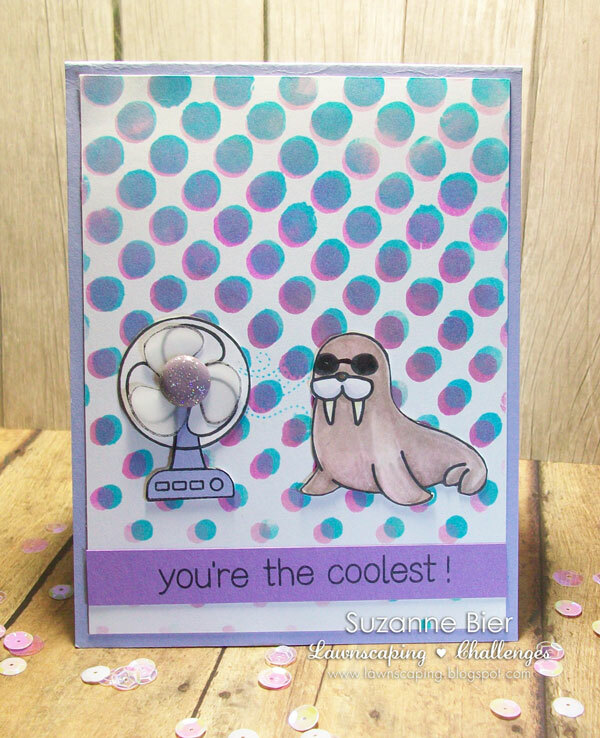 Totally cool, love the shades on the walrus!